Jan. 25, 2019 — Why does science matter? Ask science journalist Molly Bentley ’88, and she’ll give you dozens of reasons, plus a few stories. She and astronomer Seth Shostak co-host the weekly radio show and podcast Big Picture Science, an entertaining journey into the latest research and science trends. Each show has a theme and they cover a range of topics, from physics to biology to evolution. One recent show, True Grit, was a fascinating exploration into sand. Listeners learned that sand is the resource we use the most of after air and water, Bentley explains. “Almost anything you break down – concrete, glass, silicon chips – has sand,” she says. “And we’re running out of it. It’s actually triggered some small battles, black markets, and sand pirates,” she says. The show X-Flies covered the decline of the insect population “and included a really fun interview with a British scientist on just how great flies are,” Bentley says. Big Picture Science is produced at the nonprofit SETI Institute in Mountain View, California, whose mission is to explore the nature and prevalence of life in the universe. The radio show receives funding from private donors and the NASA Astrobiology Institute. It’s heard on 150 local NPR, college, and community radio stations, and has an audience of around 250,000 listeners each week. The show is a team effort and as executive producer, the Oakland, California-based Bentley collects story ideas, writes the first draft of scripts, edits audio, and does research and interviews. 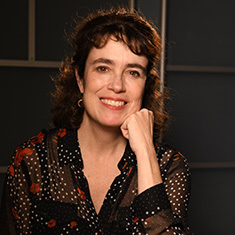 Her co-host interviews, edits scripts and adds science expertise; another producer mixes and also edits the show; and an intern/journalist does additional research. The daughter of a Russian literature scholar, Marybelle Bentley ’58, who attended Grinnell before finishing school in Wisconsin, and an acclaimed glaciologist, Charles Bentley, whose Antarctica research formed the underpinning for climate change theories today, Molly dabbled in science and radio during her time at Grinnell. She co-hosted a music show on KDIC one semester and took a few science courses, but ended up majoring in English. “I was interested in basic questions about human motivation and emotion, and I found that literature and poetry expressed both,” she says. Growing up in Madison, her father was “always explaining how things worked,” Bentley says. “I wanted to become a meteorologist but the humanities got me at Grinnell.” She almost attended graduate school in art history, having been inspired by the late Professor Richard Cervene, but instead got a post-graduation job taking calls from Wisconsin Public Radio show listeners. She was hooked and has been in radio ever since. She worked in Wisconsin on the now-national show To the Best of Our Knowledge, quit her job to travel, and ended up in Prague with her own music show. Later, she returned to the U.S. and Wisconsin Public Radio. She got a job offer from Weekend Edition Saturday, but turned it down and flew to London to work on BBC’s science unit. Later, she came to Northern California and reported on science as a freelancer for the BBC. Bentley met Shostak after interviewing him, and in 2003 he asked her to edit what was then his live, call-in science show. It eventually evolved into the nationally recognized Big Picture Science. There are numerous ways to listen to Big Picture Science. A listing of episodes can be found here. Speaking of podcasts, Grinnell College has a new one called All Things Grinnell. The first five episodes are now available.